PortExpert provides you with a detailed overview of all applications and processes that are using your network or Internet connection. You can filter the list of TCP/UDP connections to exclude local connections and/or system processes, and there is an option to "freeze" the real-time view for closer inspection. Additional features include integrated Whois lookup and Google search for process names. Several software or processes access Internet addresses without notifying you, which is why PortExpert can keep you informed on the identity of these applications. 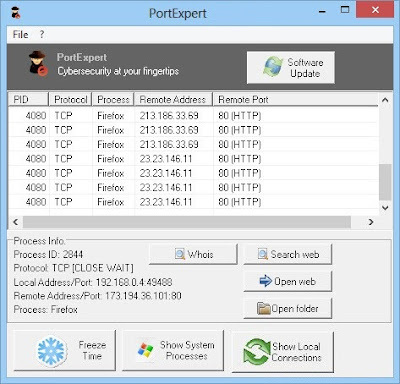 PortExpert is a simple to use application that allows you to monitor the applications which are currently running on your computer and require Internet access. The software can list all the processes which access Web pages during their runtime and indicates which IP address is being opened. The software displays a table which includes all the processes, along with their ID number, connection protocol, local address/port, remote address/port and the name of the process. Aside from displaying the applications in real time, PortExpert also allows you to filter them, by hiding or unhiding the system processes. PortExpert can display the list of programs that access webpages during their runtime and offers you a series of functions which can help you identify the remote addresses. Simply select a certain entry in the list, then click the WhoIs button in order to be directed to an online search. The software also allows you to quickly search the selected program on Google. PortExpert can monitor the software which access Internet pages while they run on your computer, which makes it a suitable solution for protecting your system from unknown risks. Moreover, it can display the local connections, the system processes and features a time freeze function, which allows you to analyze all the monitored applications at a certain moment.